Felt Animal purse is made of sheep wool.Felt purse is hand made in Nepal.This felt purse contain cotton linen and size of the felt purse is 10x14cm. This felt purse is available in assorted colour. Since this purse is hand made there can be slight variation in measurements. 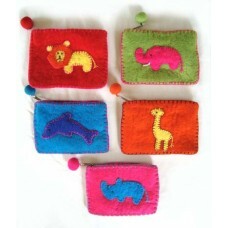 Felt purse are decorated with different kinds of Animal(Elephent, Lion, Ziraff, Rhino, dolphin). Animal are stitched with hand knitted.